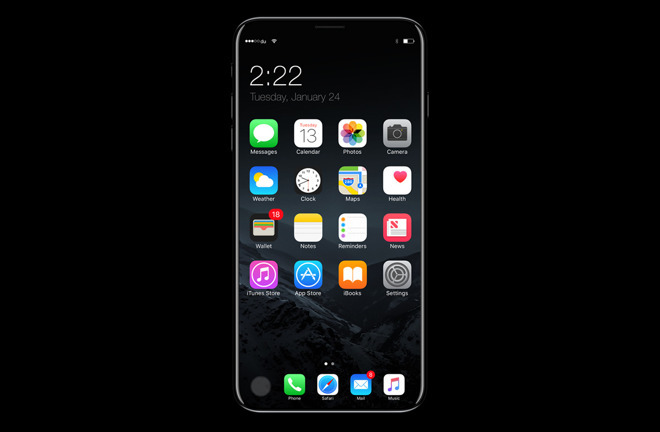 Apple is developing a custom fingerprint sensor for its OLED-based "iPhone 8," and as a result might not begin production of the device until September —well after a July start date for two LCD-based iPhone models, a report claimed on Friday. The company is planning to use an algorithm from AuthenTec —the sensor company it acquired in 2012 —and combine it with glass identification technology from Privaris, sources told DigiTimes. The sensor will allegedly be produced at TSMC's 12-inch line using a 65-nanometer process. DigiTimes has a mixed track record with regards to Apple products, however, and starting "iPhone 8" production in September would likely imply a launch date in November —a time when Apple has released other products, but never an iPhone.